I’ve always been an R/C guy as far back as I can remember. My first remote control car was corded and the remote had 2 buttons: one would make the car go forward and the other would simultaneously reverse and turn to the right. The cord between the car and the remote was about 2 feet long so I had to hobble and crawl around to follow the car as I drove it. I thought it was amazing and like many other toys before and after, it was my favorite toy until it stopped working properly. The R/C world will never be the same now that the consumer drones of 2014 have arrived. Quick and fast, camera’d up with first person view, long range and healthy battery life equals a flying camera. The company that manufactures mine even calls it The Flying Camera right on the box. I call it my 200 foot tripod. Having taken an awful lot of photos in Tacoma over the years, I often run out of ideas for intriguing, local subjects without being somewhat redundant. As a real estate and landscape photographer, my domain has expanded exponentially since implementing a quadcopter. The creative concepts made possible by drones will be invaluable to freelance photographers and videographers if the FAA doesn’t ground us all in September 2015 (date set by Congress by which the FAA must draft regulations on private and commercial drone use). 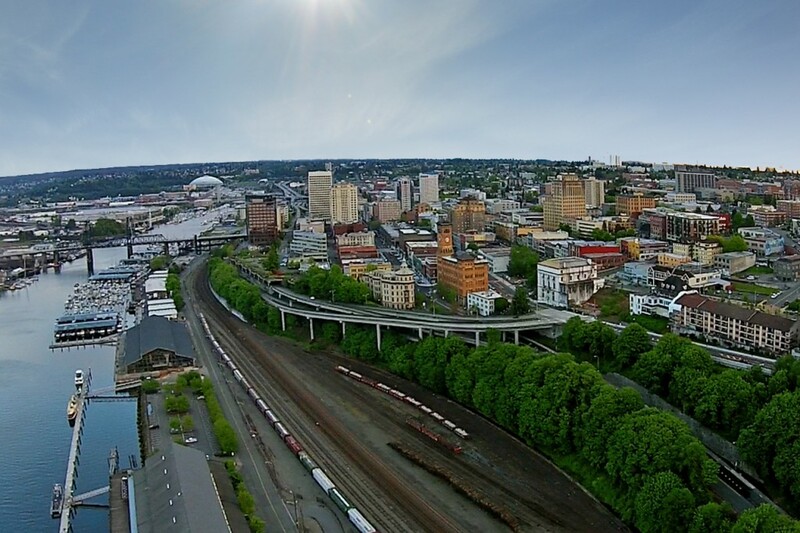 Until the laws change, you can expect to find me taking aerial photos and video all over Tacoma any time the weather is nice and I have a free hour to fly. For those of you interested in seeing it up close and personal, I now include demonstrations of modern quadcopter operation with my real estate photography MLS listing package. Contact me here to schedule a photo shoot. Copyright © 2019 Aaron Pedersen - Tacoma, WA - All rights reserved.